Which TV shows are doing the best? The worst? Cancelled or renewed? Wondering how your favorite series are doing in the ratings? Here are the season average ratings of the 2014-15 network TV shows — through the end of week 47 (Sunday, August 16, 2015). ABC shows (so far): 20/20, 500 Questions, America’s Funniest Home Videos, American Crime, The Astronaut Wives Club, The Bachelor, Bachelor in Paradise, Bachelor in Paradise: After Paradise, The Bachelorette, BattleBots, Beyond the Tank, Black-ish, Boston EMS, Castle, Celebrity Family Feud, Celebrity Wife Swap, Cristela, Dancing with the Stars, Extreme Weight Loss, Fresh Off The Boat, Forever, Galavant, The Goldbergs, The Great Christmas Light Fight, Grey’s Anatomy, How to Get Away with Murder, In An Instant, Last Man Standing, Manhattan Love Story, Marvel’s Agent Carter, Marvel’s Agents of SHIELD, The Middle, Mistresses, Modern Family, Nashville, Once Upon a Time, Primetime: What Would You Do?, Repeat After Me, Resurrection, Revenge, Rookie Blue, Save My Life: Boston Trauma, Scandal, Secrets and Lies, Selfie, Shark Tank, The Taste, and The Whispers. CBS shows this season (so far): 2 Broke Girls, 48 Hours, 60 Minutes, The Amazing Race, Battle Creek, The Big Bang Theory, Big Brother, Blue Bloods, The Briefcase, Criminal Minds, CSI: Crime Scene Investigation, Elementary, Extant, The Good Wife, Hawaii Five-0, Madam Secretary, The McCarthys, The Mentalist, Mike & Molly, The Millers, Mom, NCIS, NCIS: Los Angeles, NCIS: New Orleans, The Odd Couple, Person of Interest, Scorpion, Stalker, Survivor, Two and a Half Men, Under the Dome, Undercover Boss, and Zoo. CW shows this season (so far): The 100, America’s Next Top Model, Arrow, Beauty and the Beast, Cedric’s Barber Battle, Dates, The Flash, Hart of Dixie, iZombie, Jane the Virgin, Masters of Illusion, The Messengers, The Originals, Penn & Teller: Fool Us, Reign, Significant Mother, Supernatural, The Vampire Diaries, Whose Line Is It Anyway?, and A Wicked Offer. 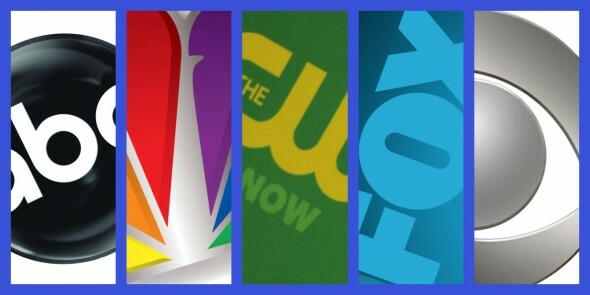 FOX shows this season (so far): American Idol, Are You Smarter Than a 5th Grader?, Backstrom, Bob’s Burgers, Bones, Boom!, Brooklyn Nine-Nine, Bullseye, Empire, Family Guy, The Following, Glee, Golan the Insatiable, Gotham, Gracepoint, Hell’s Kitchen, Home Free, Knock Knock Live, The Last Man on Earth, MasterChef, MasterChef Junior, The Mindy Project, Mulaney, Red Band Society, New Girl, The Simpsons, Sleepy Hollow, So You Think You Can Dance, Utopia, Wayward Pines, Weird Loners, and World’s Worst Fails. NBC shows this season (so far): A to Z, A.D.: The Bible Continues, About a Boy, Allegiance, America’s Got Talent, American Ninja Warrior, American Odyssey, Aquarius, Bad Judge, The Biggest Loser, The Blacklist, The Celebrity Apprentice, Chicago Fire, Chicago PD, Constantine, Dateline NBC, Dateline Saturday Night Mystery, Food Fighters, Grimm, Hannibal, Hollywood Game Night, I Can Do That, The Island, Last Comic Standing, Law & Order: Special Victims Unit, Marry Me, Mr. Robinson, The Mysteries of Laura, The Night Shift, One Big Happy, Parenthood, Parks and Recreation, Running Wild with Bear Grylls, The Sing-Off, The Slap, State of Affairs, Undateable, The Voice, and Welcome to Sweden.